Please enter the first half of your postcode to see who covers your area. if treated on same day as call out. Phil's Wasp Nest Removal service covers the Chichester and Fishbourne areas. Phil also offers a mole catching service in the winter. At Hampshire Wasp Control we have a set fee of £45.00 to treat any wasp or hornet nest, regardless of nest size or location. We do not have any hidden extra fees or charge VAT. We try our best to provide fast service on either the same day as you call or the next day at the latest. 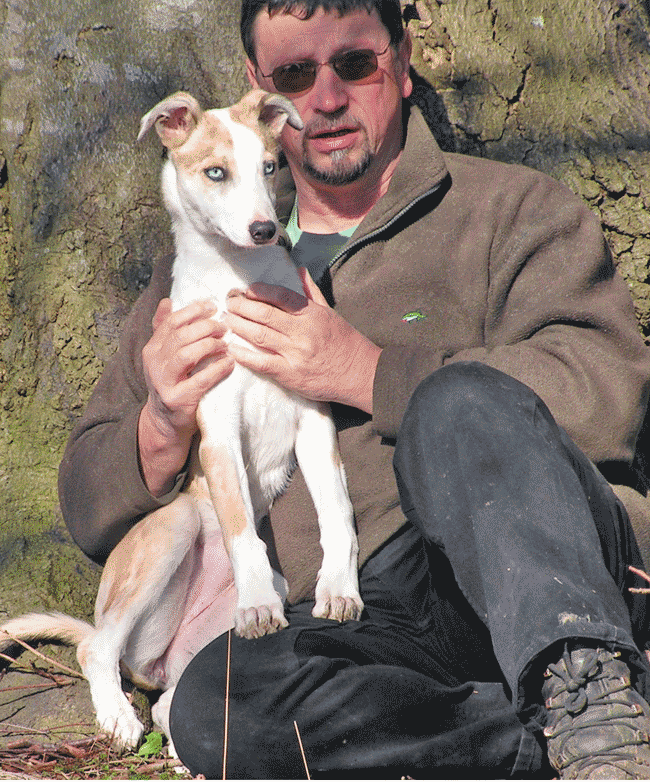 Phil has been a Pest Controller in the Hampshire area for over 30 years. He has a vast amount of experience in treating Wasp and Hornet nests. 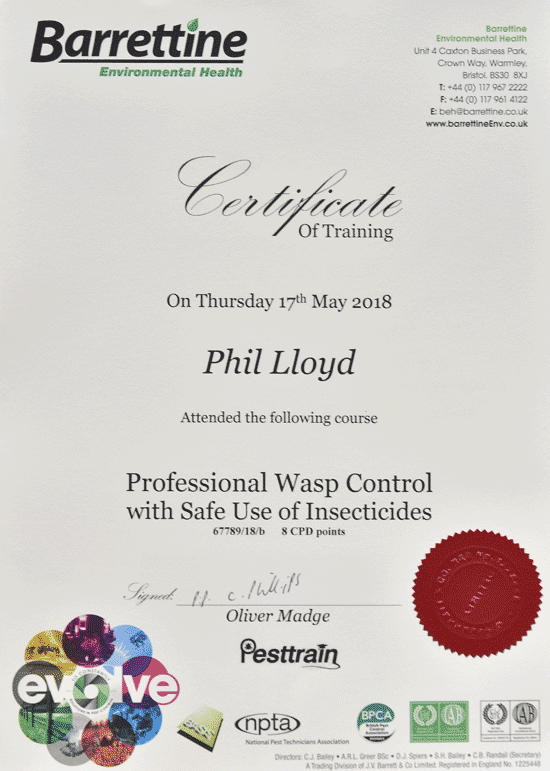 Phil has successfully passed the prestigious Training course for Professional Wasp Control, with the Safe use of Insecticides. If you have a wasp or hornet problem and live in the Chichester (PO19) area and need to get rid of the nest fast, why not give Phil a quick phone call? We charge a set fee of £45.00 to treat a Wasp or Hornet nest regardless of its location. There are no hidden extras for call outs, climbing ladders, working in lofts or unnecessary treatments. We can treat any additional nests that you have found on your property if you want us too while we are there. For this, we charge another £10.00 per nest (obviously if treated on the day of the original call out). As certificated and fully insured operatives, all our work is guaranteed. Payment is required on completion of work. Note: We do not accept bank transfers. We are not registered for Value Added Tax. Make sure you have identified the species of flying insect before calling us. If you are unsure, please text us a clear photo and we will be happy to help determine your problem or call us and we will talk it over with you and advise. While it is understandable that you may wish to have a go and treat the nest yourself, using proprietary products which you might have purchased, we strongly advise against doing this! We mention this because in our experience, for every success story this action can often end in a complete disaster. However, if you do wish to embark upon this often hazardous endeavour, do not call us to sort out the frequently dangerous aftermath. Please do not call us out for bees. We do NOT treat any bee species. Note: if you book our services you will be given an approximate time slot of morning or afternoon. We will do our utmost to be there as promised. Please make sure you are at home when we arrive. For your safety: we advise for several hours after treatment, keep children and pets indoors and windows/doors closed. If you have found a nest while out in your garden and it is a Saturday or Sunday, don't worry, give us a call and we will try to come out as soon as possible. Hampshire Wasp Control - call us now and get rid of your wasp nest today!